CLICK HERE to buy this Product with FREE Shipping! 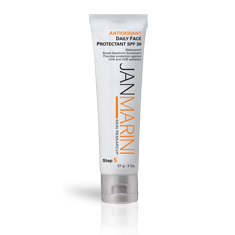 The JMSR Antioxidant Daily Face Protectant SPF 33 is designed specifically with this in mind while ensuring continuous coverage for daily or extended exposure conditions with a broad-spectrum SPF 33 rating. Antioxidant Daily Face Protectant SPF 33 is also available in three gorgeous tints: Sunkissed Sand, Sunkissed Neutral, and Sunkissed Bronze. Our "Sunkissed" colors have been created with skin friendly iron oxide minerals that will beautifully enhance virtually any skin tone.